The design on the clock is a simple design to do. The tricky part is covering the clock. 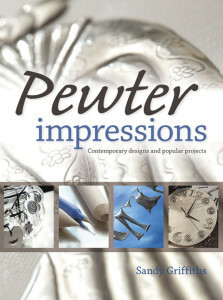 Start of by practising with paper templates before trying to cover the clock with pewter. 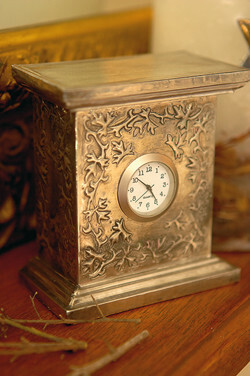 Most people have been astounded to discover that this glamorous antique-look-ing clock is a simple superwood clock which was found in a decoupage shop. The baobab tree has a strong link to our diverse African continent, which conjures up thoughts of great con-trasts, strong colours, soft rain, heady spicy smells, cruel death and the great gift of life in sometimes harsh but beautiful places. 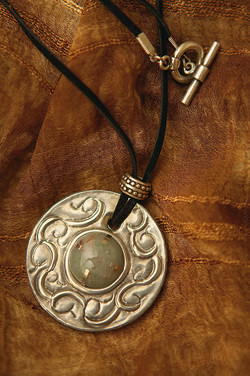 This is one of the most popular designs in pewter art. 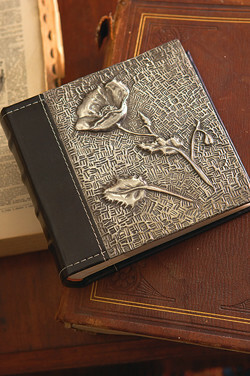 The style of book that works well has a leather or cloth-bound spine. 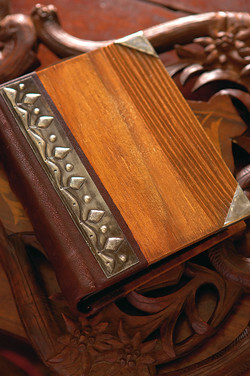 You cannot cover the entire book with pewter, as the pewter is not soft enough to work as a spine – you would not be able to open the book if the pewter extended around the spine. You can cover either the front only, or the front and the back. Bottles are great to work with, as they need no preparation. Keep a look-out for interesting bottles. 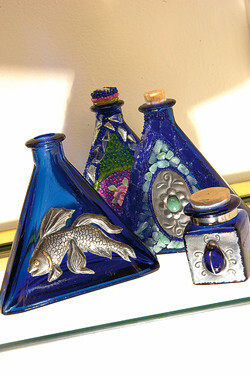 Once your eye is tuned, you will find bottles and glass items with wonderful shapes and gorgeous, deep jewel colours that come to life when light shines through the glass. Look in antique shops and at junk sales. Never throw away another bottle without having a good look at it and, if need be, abandon your favourite wine and look for one in a more attractive bottle. 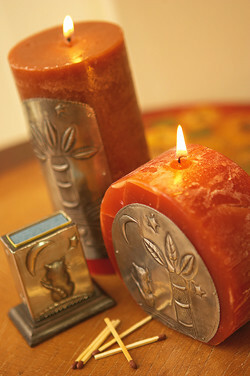 Candles are wonderful to decorate with pewter designs as there are so many shapes and sizes, and adding a simple pewter design can turn a plain candle into a really great gift. I just love this cheeky little fellow. I have used the design without the branch. I felt he suited this project really well by walking along the edge of the glass dish, rather than walking along his branch. He is completed in high relief. I find birthday cards are always fun to make because birthdays bring out the child in me, making me think of cupcakes, balloons, bright, cheerful colours and, of course, the hope of lots of presents. Superwood frames are freely available at all hobby, craft and art shops. They come in various sizes and shapes. 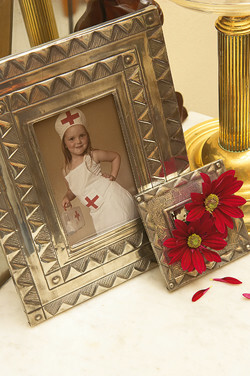 You can cover the frame with pewter or you may paint the frame and glue a cut-out design onto the painted frame. 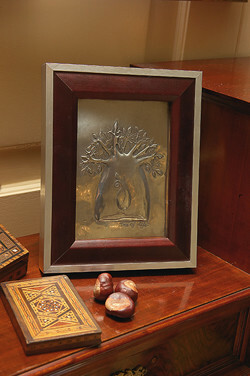 Ready-to-use frames are also great for decorating with your own pewter touch. Look around at the home stores – they have a lovely variety of frames at reasonable prices. 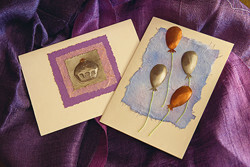 Even the smallest off-cuts of pewter can be used to decorate greet-ing cards. 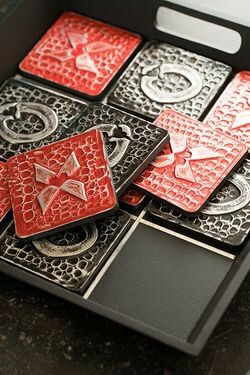 The paper embossing on the card echoes the relief model-ling of the pewter work and gives the card an attractive finish. This jewellery box is one of my favourite projects. I love the human shape with its beautiful soft curves and splendid form, designed so well to hold life, and of course life is our patina. 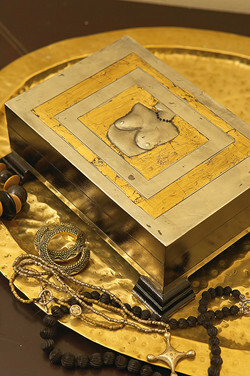 Since this is a jewellery box, I felt it needed a feminine feel reflecting jewels or jewellery in some form. A few plain black seed-beads did the trick. These are very popular. 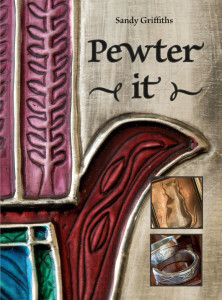 Replacing an ordinary cream light-switch cover with a gorgeous pewter one will transform any room. 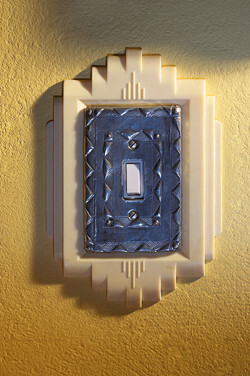 The challenge when placing a design on a light-switch cover is that the design must fit around the various screw and switch holes, and preferably incorporate them. It does not work to have a screw placed in an inappropriate area of the design. All of this must be factored into your design. I positioned the dragonfly’s body so that the screw would form one of its segments. The screws also make good flower centres. 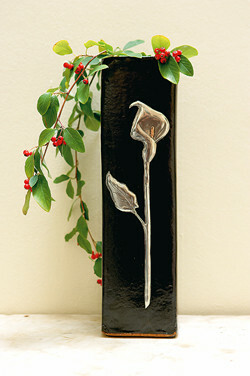 The long stemmed silver lily is very striking on this long black vase. I diluted the patina with a little water before applying it to the completed design, as I wanted the lily to remain quite silver to contrast with the black vase. 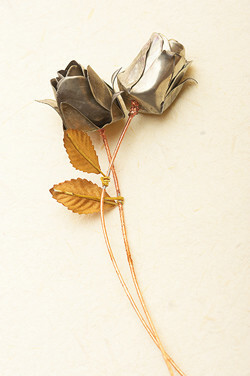 But I still wanted the patina to give the flower depth by sitting in the recessed areas. 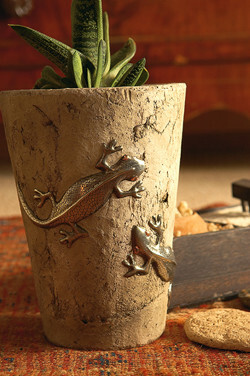 As soon as I walked past this ceramic planter, I knew it would work well with pewter, as the cracks on it have black rubbed into them. The lizards are completed in high relief and then cut out using a pair of curved cuticle scissors with the curve facing away from the area of the design being cut out. 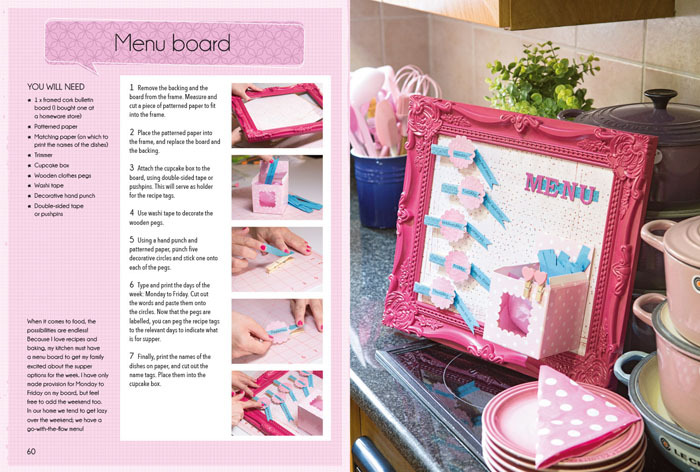 You may find it easier to use a craft knife and a cutting mat. I was drawn to this box by the attractiveness of the catch. The inside is divided into 12 little compartments for holding earrings. It also started out its life as a superwood box begging everyone who passed it by to breathe some creative life onto it. Well, I decided this was the opportunity to explore the wonderful North African design I had found in a book. For this project I have used a superwood disc which I found at a decoupage shop. Ask at the shops that sell blanks – they often have people making these for them and will sometimes order a shape you need. 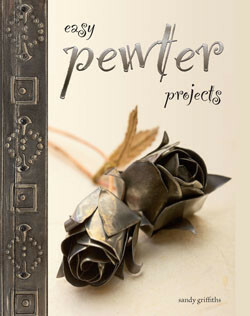 This project really excited me, as it was my first three-dimensional pewter project. I found a little paper rose which I had decided to take apart so I could work out how it was made, to teach the technique to my kiddies art class. Once again the ‘I wonder if this would work in pewter’ thought crossed my mind. So instead of cutting the pattern out of coloured paper I cut it out of pewter and found that it did indeed work well. By the way it also works with coloured paper. Finally arriving at the point where I used pewter embellishments on a scrapbook page was a long and interesting journey for me. I have never had the desire to do scrapbooking, but after looking around at all the things one can buy to place on the pages, I decided to make some embellishments from pewter. 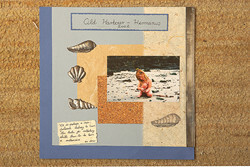 I used pewter shells and a matching pewter strip on one page, and pewter frames and labels on the other. 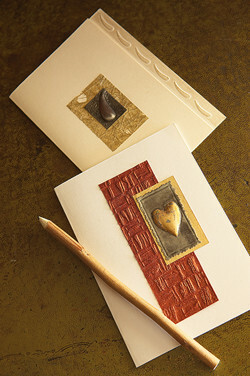 Browse in scrapbooking shops for further ideas, as many of the embellishments can be done in pewter: photo corners, labels, headings, hearts and other shapes – a great way to use up your scraps of pewter. Tins are very trendy and make a lovely presentation for a simple gift. 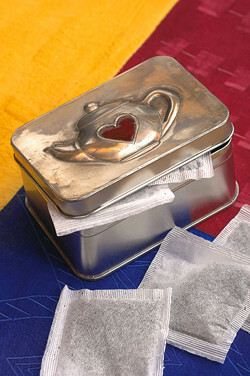 This simple little tea tin may be used to package some delicious teas or a pack of yummy shortbread. Doing this project will teach you how to deal with any round or oval shape that needs to be covered. I found this set in a shop selling decoupage blanks. I think you will agree it has a lovely old-fashioned feel. 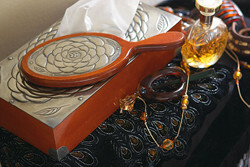 One can picture it on an ornate dressing table, carefully placed on a hand crocheted doily. 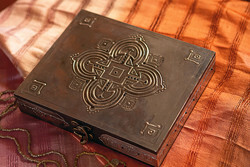 By changing the pewter-work design, you can also give it a modern look. 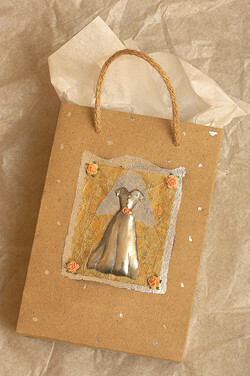 Simple gift bags embellished with even the smallest pewter-work design, become part of the gift you are presenting. 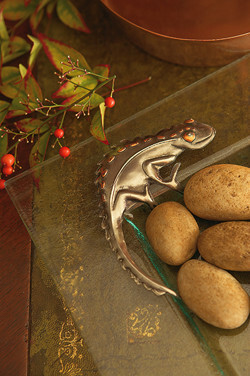 Suitable designs can be done on the smallest pieces of pewter and the end result is really worth the effort. I found this book in a craft store and it was just crying out to be decorated with pewter. I really liked the soft leather spine which contrasts well with the hard, textured wood-grained cover. All in all it has a great feel and I wanted to work on it. 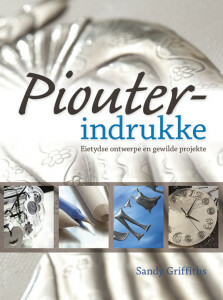 Because of the beautiful natural materials the cover is made of, I wanted a design to enhance but not detract from this. I wanted to design a playful, but also useful gift with a difference. The X and O squares are actually a set of coasters, so here you have a game, coasters and a small tray - all in one!